The New York Islanders announced today that they have agreed to terms on a three year entry-level contract with first round draft pick Nino Niederreiter. The Islanders selected Niederreiter with the fifth overall pick in the 2010 National Hockey League Entry Draft in June. Niederreiter, a native of Chur, Switzerland, played his rookie season in the Western Hockey League last year, leading the team in goals with 36 and registering 24 assists for 60 points in 65 games with the Portland Winterhawks. The 18-year-old center also appeared in 13 playoff games with the Winterhawks, notching eight goals and eight assists for 16 points. 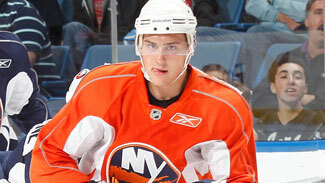 Last week, Niederreiter scored the Islanders’ first goal in game one of their two-game set against Boston. On the international stage, Niederreiter represented Switzerland at the 2010 World Junior Championships, where he lead the team with 10 points in seven games (6 goals, 4 assists) and was named to the tournament all-star team. He also played in four games with Team Switzerland at the World Championships.